I know everything is going to work out, but tomorrow we are moving Amelia to an undisclosed location to continue her makeover and the thing is that she hasn’t moved from her spot in over three years. And before that she moved a few spaces closer to the office of Hidden River RV and Canoe Park. So….in my brain in the middle of the night I’m thinkin’…. Will the backup lights work? We did buy those cool magnetic back up lights that you can slap on in a hurry. Those should work…. Will the axel hold up? Haven’t a clue what that even means! Will the tires hold up? Thanks to Alvin @ FX and Clive, my favorite contractor, she has really new tires/wheels. Will my movers show up on time TOMORROW? Why are we doing this at 4:30 pm, which, in most civilized communities, is known as RUSH HOUR? 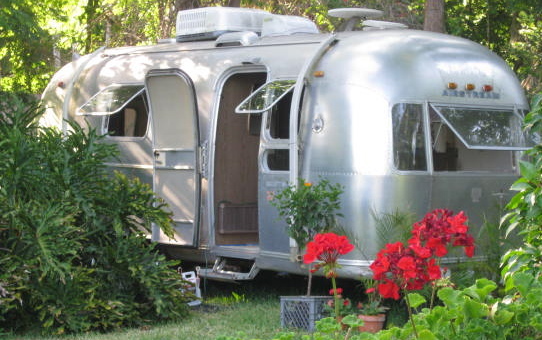 Then I think…..if we’re towing a vintage ’72 Airstream Safari, maybe being stuck in traffic is a good thing. Everything slooooows dooooown……..
Gotta tell you I have been waiting for this moment for two months, so what’s one more night of pre-recorded television at 3:00 am? 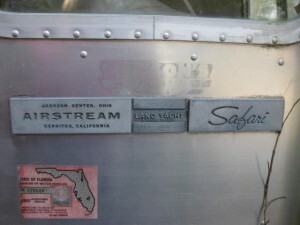 Wish us luck on the maiden voyage of Amelia Airstream!